Oh the Laurel Lake Camp is the truest and the best, and we work real hard, and we never take a rest. And we have one yell, and we yell it all together. And it goes like this, “Laurel Lake forever!” Bum ba da dee ah dum. Some camp! Yes, we sang that song every single day at camp. It was, let’s say, the late ’80s, and my mother had shipped me and my sister off to camp some four hours from home, so even if we got freaked out we had to tough it out. What a smart woman my mother was back then, but at the time I didn’t think so. Anyway, camp sessions were separated into weekly increments, so we knew when we got there on Sunday afternoon that we would be packing up and heading back home on the following Sunday morning. It was like checkout time at a hotel, there were no late checkouts. We had to be out of our cabins so they could clean them (yeah, they totally cleaned them) for the next rambunctious crew to arrive that afternoon. And during that long week they packed in so many activities it made my head spin, but in a good way. Every day from sunrise until close to sunset we were up and moving, from gymnastics to archery, from swimming to survival, to everything in between. But every day started off with that camp song, and if we didn’t sing it loudly or enthusiastically enough then we had to start all over again until we had accomplished it. There were several days where I remember we were hoarse by the time they finally gave up on us, which is why to this day I still remember the song word for word. Well, that, and the fact that it’s an easy song. Night was different though. 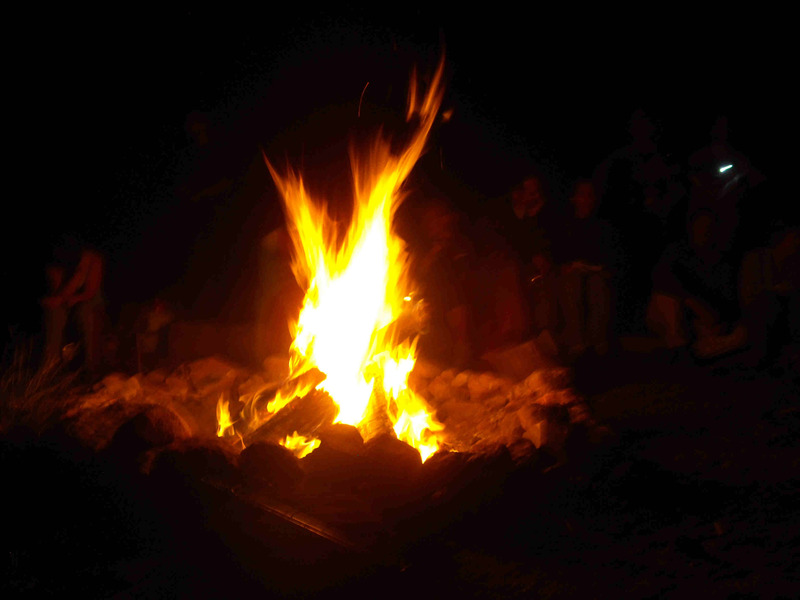 Every night after dinner we would gather around an impressive campfire (I never did find out how or who created it because it wasn’t ever there before dinner) somewhere on the grounds and sing songs. One year I remember the camp musician was a man they’d had imported in named Dan Francisco. I remember his name because it rhymes with one of my favorite cities, but we weren’t supposed to make fun of him. He had this huge guitar that he would balance precariously on his lap while he led us in song. But unlike the morning chant of the camp song, the songs at night were like vespers, quiet tunes that we sang together in hushed tones, almost like lighter songs. And the nights were beautiful. The crickets would be chirping in the background, but the bugs left us alone. Instead they were drawn inextricably to the fire itself, so we would see them illuminated just above the reaches of the flames, doing a death dance that was apparently worth it for them because they never stopped. Just when the fire would start to die down one of the cabin leaders would throw a few more sticks on, and we would huddle closer to it, reaching out our hands for our own brand of salvation. If we left a campfire without smelling like burning logs we hadn’t done it right. Most nights we could smell our clothes and they had been permeated. It was precious. Those campfire twilights were the best, and even nearly 30 years later I long for them again, or maybe just for that innocence of youth when the world was in front of me in all its glory like a raging campfire being fed constantly by more wood. We would go meander back to our cabins afterwards, drunk on the songs, on the fire, and on the shared experience. It was a bond forged in friendship, in music, and in fire.